Jessica Ehule, MS, MSPH, joined the CityMatCH team in December 2016. She serves as the Public Health Project Coordinator for the Coordinated Intake and Referral (CI&R) project and the Ohio Institute for Equity in Birth Outcomes. 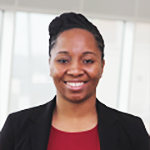 Jessica earned her MSPH from Meharry Medical College in Nashville, TN where she served as President of the Division of Public Health Practice Student Association. In this role, she refined her leadership skills and laid the foundation for future executive boards working in local underserved communities. Prior to CityMatCH, Jessica served as the program coordinator for a K-12 STEM pipeline program based at Meharry Medical College. She has experience in program planning and implementation, program evaluation, and building partnerships. Jessica looks forward to gaining knowledge from her coworkers at CityMatCH and vows to continue working towards health equity for minority and underserved populations. In her spare time, this Ohio State Buckeye enjoys exploring cuisines of the world and stress-relieving abstract painting.